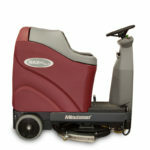 Minuteman’s Automatic Scrubbers have always offered a complete range of sizes to meet your cleaning needs. From the Port A Scrubs for small and quick cleanup, the E Series walk-behinds, the H Series scrubbers specifically designed for hospitals and healthcare facilities, to the ERide rider scrubbers for large applications. 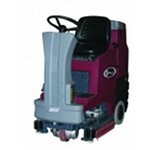 Our automatic floor scrubber inventory contains a machine for every facility’s needs and budget. Learn more about some of our rider floor scrubbers below! 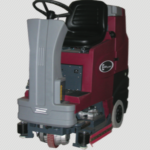 Notable features of the E Ride 26 include a 26-inch cleaning path, 27 gallon recovery and solution tanks, dual side entry, five position control panel, 180-degree operator view, fully variable solution flow rate and two caster wheels that ensure the squeegee is always properly aligned. 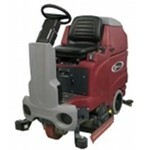 The E Ride 26 automatic rider floor scrubber is available in both disc and cylindrical systems. Interchangeable scrub decks make the E Ride 28 a versatile machine. Benefits include a see-through solution tank lid, fully variable solution flow rate, see-through vacuum motor cap for easy visual inspection of the filter, tilt steering, removable debris box, dual side entry and heavy-duty steel construction that will last for years of regular use. 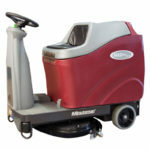 This automatic rider floor scrubber features single front wheel drive for maximum traction, a cushioned safety seat for enhanced operator comfort, a polyethylene battery tray that protects the machine and helps prevent acid spills, easy-to-read controls, three electronic brakes for safety and a self-tracking squeegee that leaves the floor completely dry in one pass. If you are interested in other Minuteman cleaning solutions, check out the rest of our products, including vacuums, floor machines and floor sweepers. We have service areas throughout the United States, including Chicago, Los Angeles, Pingree, IL and more. To find out more, get in touch by visiting our contact page and filling out the form, or call us at (847) 264-5400.